Don't be biased against curved piecing anymore! Stitching traditional wedding ring quilts often evokes imagery of battling the fabric bias while pinning and stitching curved fabric. What a headache! But we have a solution that has been tested! We put our novice stitcher to the test to see if she could successfully stitch a quilt block using the methods outlined in the Wedding Ring Applique collection. We gave her no special guidance. Once you try Eileen Roche's techniques for preparing and sewing curved fabric–you're options for creativity will expand. 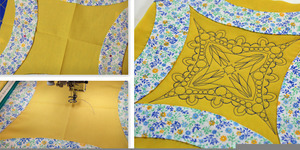 Top off the quilt with embroidery designs sized to fit the pieced quilt. Voila! You have made an heirloom quality quilt! "So this is why people stitch!" "What a satisfying and productive day!" "This is afternoon bucket list fun!" "I had no idea I could sew a curve!" "I'm no longer a beginner!" Once you try Eileen Roche's techniques for preparing and sewing curved fabric–you're options for creativity will expand. 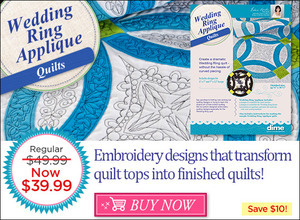 Top off the quilt with embroidery designs sized to fit the pieced quilt. Voila! You have made an heirloom quality quilt!